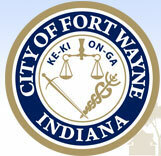 The City of Fort Wayne’s Redevelopment Department is inviting residents to a public meeting about the preliminary findings from a recent downtown parking study. The study includes an inventory of available downtown parking, an analysis of current and future demand for parking, and possible strategies to accommodate future growth. The meeting is scheduled for Monday, October 29, 5:30 to 7 p.m. in the Omni Room, which is in the lower level of Citizens Square, 200 E. Berry St.
Paul Spoelhof is the City of Fort Wayne’s new Planning & Policy Director. Spoelhof replaces Pam Holocher, who retired after 40 years of service to the City of Fort Wayne. Fort Wayne Mayor Tom Henry today announced that the City’s Office of Housing and Neighborhood Services is the recipient of a $680,000 grant to remediate lead paint in older homes. The City will partner with the Allen County Department of Health to identify children with elevated blood lead levels and remediate lead paint in their homes, or the homes where they attend day care or visit often. Recent changes to City Code now require all vehicles parked on private property and within public view to have valid license plates and current registration stickers. At the request of neighborhood leaders, Neighborhood Code Compliance presented amendments to City Code last year to the Fort Wayne City Council for approval. One of those amendments requires all vehicles parked on private property, and visible from public property such as a sidewalk or the street, to have valid license plates. Wednesday, October 3, 2018 -- The Johnnie Mae Farm, located at 2518 Winter St., is hosting a Harvest Celebration Friday, October 5 from 4 to 6 p.m.
All remaining fruits, vegetables and flowers will be harvested and offered free of charge to residents on Friday. Collard and mustard greens, tomatoes, zucchini, green beans and peppers, should be available. After Friday, gardeners will prepare the planting beds for winter. In addition to the produce, the celebration will include free children’s activities.